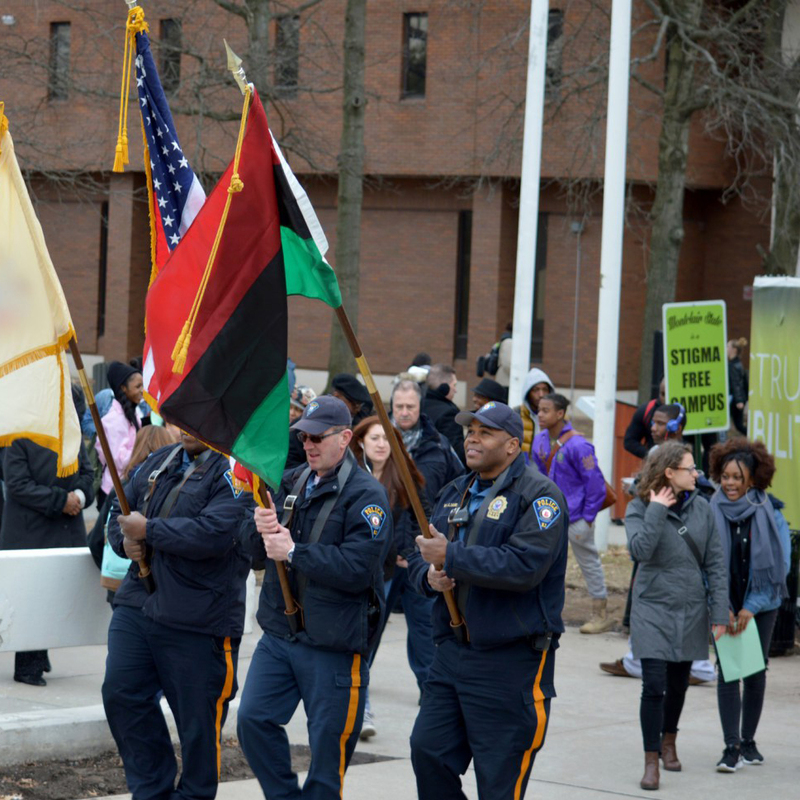 Montclair State University kicked off Black Heritage Month by having its annual Pan-African flag raising ceremony on Thursday, Feb. 1. Starting at College Hall, many students and faculty of color gathered together and walked to the Student Center quad where the actual flag raising took place. The Pan-African flag symbolizes unity in all who are of African descent, making Black Heritage Month a campuswide experience. The ceremony began with a libation by Dr. Sandra Lewis, followed by an opening statement from President of the Black Student Union Briana Matthews. Vice President of Student Development and Campus Life Dr. Karen Pennington also made an appearance, delivering a welcoming speech prior to Christopher Cottle and Dominic Bowman performing the Black National Anthem as the flag was raised. Each year, students of color along with the African-American studies department come together to create the programming for Black Heritage Month. The month is a campuswide experience that features many events to promote and educate this year’s theme, “Stepping on the Shoulders of Greatness.” The theme emphasizes that in order for black youth to look to the future, they must look back and recognize the people that made a change before them. Psychology Professor Dr. Saundra Collins explained the meaning of this year’s theme. The ceremony was followed with a reception where students in Greek organizations recognized African-Americans that came before them and left a huge impact on their lives. As the event drew to a close, there was an educational lesson on prominent African-Americans like Philip Randolph, Carter G. Woodson and Thurgood Marshall, aiming to inspire and motivate students of color to strive to make a huge impact on the world.